Join us for a “Thank You for 30” T-shirt group photo with President Diana Natalicio! 1. Arrive at Centennial Plaza a few minutes before noon. 2. Wear your “Thank You for 30” T-shirt. 3. T-shirts will be available for purchase at Centennial Plaza from 10 to 11:30 am on April 10. 4. Staff will organize participants behind the riser, and a photographer from UC will take a series of photos from three different vantage points. 5. HAVE FUN, and enjoy the opportunity to celebrate UTEP and all we’ve accomplished under the remarkable leadership of President Natalicio! No problem - the UTEP Bookstore has you covered. Remember, T-shirts are $5 plus tax. More UTEP merchandise is available at the Bookstore. 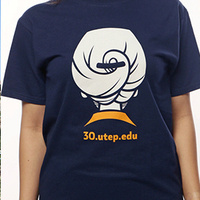 Make your gift at 30.utep.edu.